They may only last a few minutes, as opposed to hours in the Alps, but the UK is littered with gradients of 1:4 or steeper. Devon, Cornwall and the Lakes, in particular, are hot spots for the type of climb that leaves you gasping and straining. Steep roads are marked with either a single arrow for climbs of over 10 per cent or double arrows for those of 25 per cent or steeper. On our photo shoot in Devon for this article, we even found a 1:3 gradient — there are only a handful of these in the UK. Hardknott Pass is a minor road from Eskdale to Cockley Bridge in Cumbria, and it vies with Chimney Bank in Rosedale, North Yorkshire, for title of steepest road in England. Both are recorded as being 33 per cent and are signed as 1:3. The steepest road in the UK is the unclassified road at Ffordd Penllech in Harlech, Wales; officially described as not suitable for vehicles, it is 1:2.91 at its steepest. It is possible by bike, as long as a strong and determined cyclist rides the bike. The secret to enjoying these monsters is attitude: they need to be viewed as a challenge, a test of your grit and determination as well as leg strength. Certain masochistic cyclists are so enticed by the thought of these leg and lung breakers that specific hill-climb races are organised around the country for riders willing to take on super-steep hills against the clock. 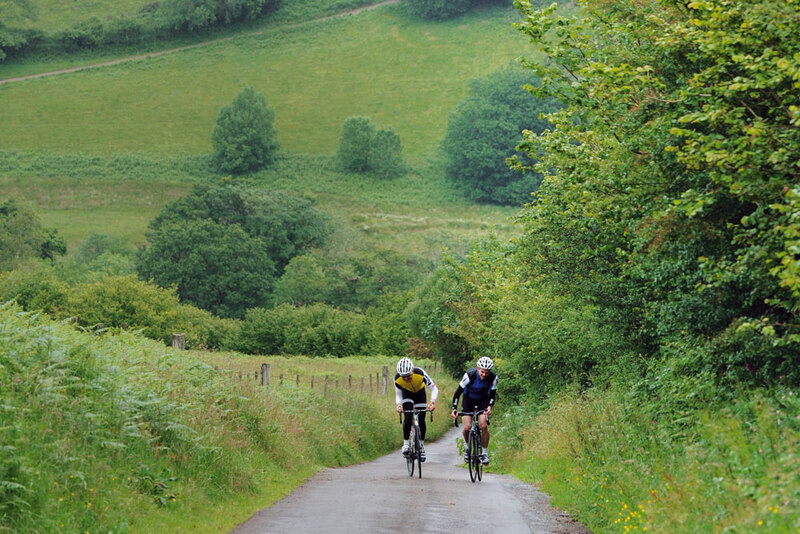 Cyclists have always appreciated the chance to pit themselves against a gradient; the oldest continuously run bike race in the world is the Catford Cycling Club Hill Climb that has been run since 1887 on Yorks Hill, in Kent. Of course, what goes up must also come down, and the descents can be almost as fearsome as the climbs are leg burning. If your heart is hammering to get up the climb you may well find it in your mouth as you cling on at break-neck speeds on the descent. Inevitably, power to weight ratio plays a huge part in how successful you are on steep hills, but your ability to tolerate the accumulation of lactate in your muscles is also significant. Upper body strength and your core play a bigger role in muscling your way up steep hills than they normally do on the flat, so if you are struggling then this is an area to address off the bike. 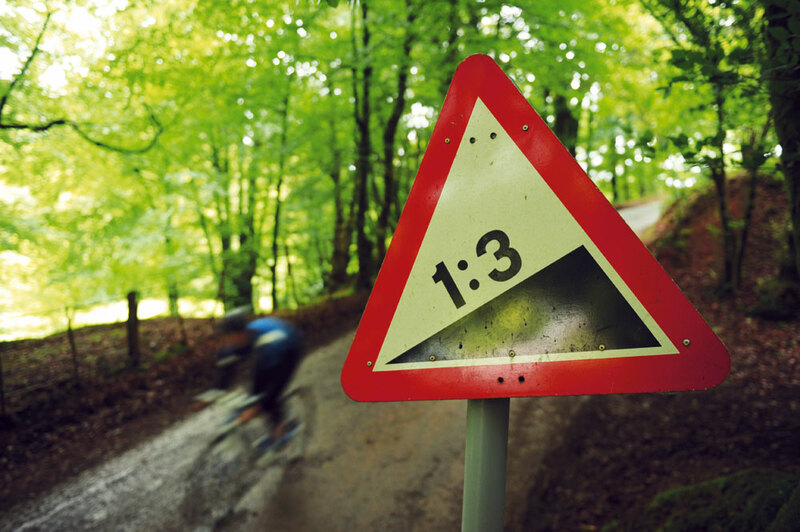 The good thing to remember about UK climbs is that they are seldom long and steep. Just at the point where your legs are on fire, veins are popping in your forehead and you are sucking in air from every available orifice, the top will arrive. So, how can you train for steep hills? Well, the best way is to ride them frequently. This will have the double bonus of forcing you to improve in many other aspects of your fitness at the same time, so not only will you be better at hills, you will be better at everything. Pushing your heart rate close to maximal effort, which is invariably what will happen on a steep climb, triggers many training adaptations. Repeated one-minute efforts at near maximal heart rate have been shown to boost your VO2 max — the maximum rate that your body uses oxygen during exercise. It will also help improve your lactate tolerance, helping to raise your lactate threshold so that cycling feels easier at any other given effort level. Riding steep hills is effectively weight training for the legs because of the huge resistance you are working against; this will help strengthen bone, ligament and tendon connections. If you can embrace hill training it will really benefit you. Before you attempt any hill training, make sure that you are fit to do so. If you have been sedentary for a long time, have any health concerns or are seriously overweight, check with your GP first, as hill riding will put your body under some strain. 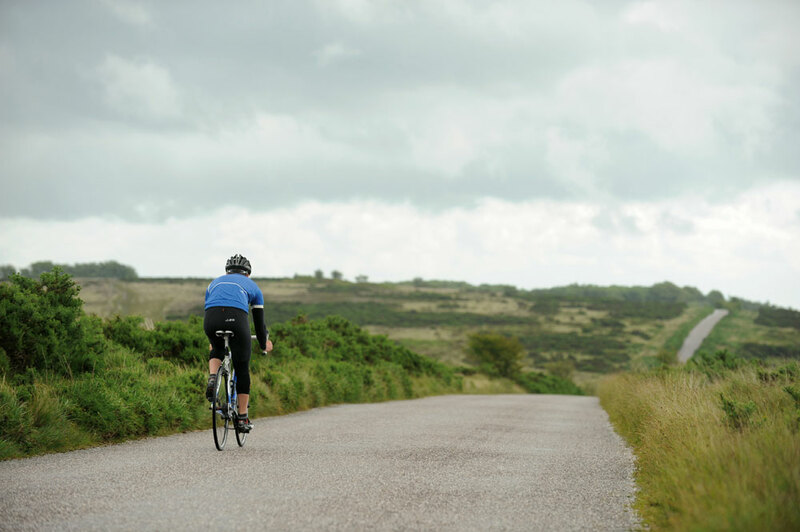 Riding hills as part of a ride is a different challenge to taking on a hill-climb time trial. Firstly, during a ride you will have the benefit of momentum. If you can see a steep climb coming up use the flat or descent leading into it to build up some speed. Even if you are going faster than you normally feel comfortable with try and resist using the brakes as you’ll scrub off speed that would be more use propelling you up the slope of the climb — the gradient will naturally slow you down anyway. Think about your gearing before you need to shift, particularly the shift from big to inner ring, as attempting this under load can lead to the chain jamming or a dropped chain. Shift to the inner ring on the descent and shift into a smaller sprocket at the rear, as you don’t want to find yourself spinning fast against no resistance, as again that is a waste of your momentum. This also allows you to gradually shift into easier gears as the gradient begins to take its toll. Stay seated as much as you can as this is more efficient, but eventually the gradient may demand you stand. Keep the transition to standing smooth by pushing down on the pedal as you pull yourself up out of the saddle. On really steep hills, when you’re out of the saddle, use your upper body to help apply weight to the pedals. Focus on an arm-led action, pulling left and right across your body so the bike leans from side to side while you stay fairly still. Stepping on the pedal as it is positioned directly underneath you allows you to use your full body weight to press down on the pedals. When out of the saddle, keep the elbows slightly bent and your head up looking where you are going. Looking down will encourage you to slump your shoulders and drop your chest, making the climb feel harder and restricting your breathing. Pull yourself slightly forward of the saddle and use your arms for leverage. You still need to keep some body weight over the rear wheel to keep it firmly in contact with the road surface and for the bike to stay balanced. If the road surface is greasy you may need to stay seated to prevent the rear wheel from spinning out. When seated, make sure you are making full use of the pedal stroke by pulling up as well as pushing down on the pedals. Your cadence will naturally have to slow down to take advantage of this. If a hill is really steep, zigzagging across the road — where safe — can help take the sting out of the gradient. Road gradients are expressed in two ways: old style, as in 1:4, or the newer method of expressing it as a percentage, 25 per cent. The older method uses a standard unit of measurement and relates the number of inches, feet, yards or miles travelled vertically (the vertical rise) with the number travelled horizontally. In other words, if you climb 10 yards over a 30 yard horizontal distance, that hill is a “1:3” or “1 in 3” — so a steep incline. The percentage method is almost exactly the same. The vertical rise is measured against every 100 units along the horizontal. So if you rise 33 units in 100 units the gradient is 33 per cent — the same as 1:3.